*Note: Don’t use regular table salt here. It will sink to the bottom of the spice mix and not evenly season the cauliflower steaks. Preheat George Foreman grill by plugging it in, or setting it to MAX, 400°F or setting 4. In a small bowl, stir together onion, garlic, poppy seeds, sesame seeds and sea salt. Set aside. Remove leaves from cauliflower and cut out core. Slice cauliflower into 1” thick slices. Note: Depending on how large cauliflower is, it may yield only 3 steaks, or up to 5 for a larger head of cauliflower. 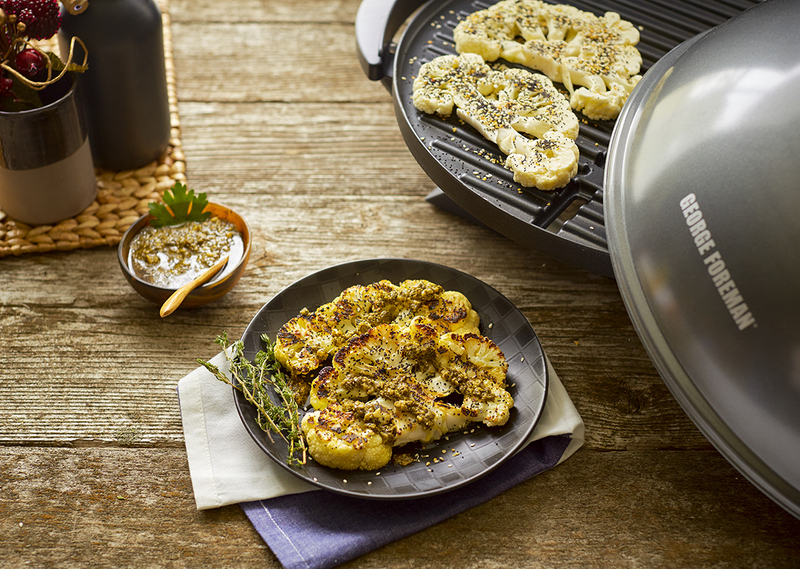 Brush both sides of cauliflower steaks with oil. Place on preheated grill and sprinkle half of seasoning over steaks. Close lid and grill for 8 minutes. Flip steaks and sprinkle with remaining seasoning. Close lid and grill for additional 8 minutes, until tender.